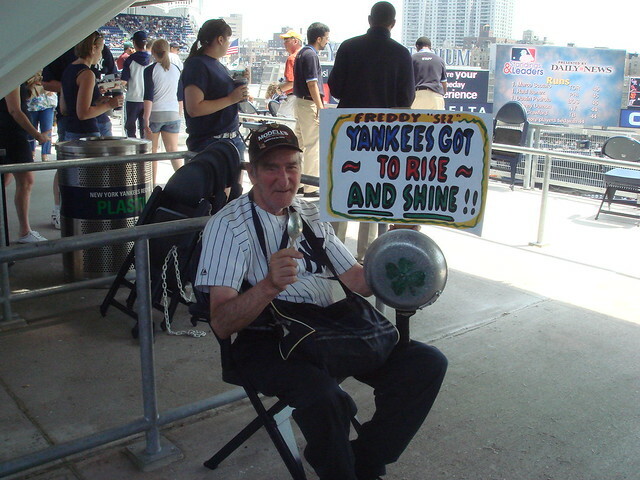 Freddy Sez takes a break during a trip around the new Yankee Stadium in 2009. Photo via flickr user storm2k. Since 1988, Freddy Schuman, better known as Freddy Sez to Yankee fans, has traipsed around Yankee Stadium with his homemade signs urging on the Yanks to win. The familiar ping of a spoon hitting his pan fills the air, and as it grows louder, fans know that their chance to bang the pan is just around the corner. Unfortunately, though, Freddy has made his last sign. The Daily News is reporting that Freddy has passed away today. Chuck Frantz, Schuman’s long-time friend, has conveyed the bad news to the paper and confirmed that Schuman suffered a heart attackthis afternoon. When the new stadium opened, Freddy at first had a tough time getting in, but the Yankees eventually found tickets for him. He hadn’t been as loud a presence at the new stadium, and his health, never strong in the first place, seemed to be failing him lately. He was 85 at the time of the his death. After the jump, watch a short documentary on Freddy Sez from No Mas.